Value-sensitive decision-making is an essential task for organisms at all levels of biological complexity and consists of choosing options among a set of alternatives and being rewarded according to the quality value of the chosen option. Provided that the chosen option has an above-threshold quality value, value-sensitive decisions are particularly relevant in case not all of the possible options are available at decision time. This means that the decision-maker may refrain from deciding until a sufficient-quality option becomes available. Value-sensitive collective decisions are interesting for swarm robotics when the options are dispersed in space (e.g., resources in a foraging problem), and may be discovered at different times. However, current design methodologies for collective decision-making often assume a well-mixed system, and clever design workarounds are suggested to deal with a heterogeneous distribution of opinions within the swarm (e.g., due to spatial constraints on the interaction network). Here, we quantify the effects of spatiality in a value-sensitive decision problem involving a swarm of 150 kilobots. We present a macroscopic model of value-sensitive decision-making inspired by house-hunting honeybees, and implement a solution for both a multiagent system and a kilobot swarm. Notably, no workaround is implemented to deal with the spatial distribution of opinions within the swarm. We show how the dynamics presented by the robotic system match or depart from the model predictions in both a qualitative and quantitative way as a result of spatial constraints. This work was partially supported by the European Research Council through the ERC Consolidator Grant “DiODe: Distributed Algorithms for Optimal Decision-Making” (contract 647704). Vito Trianni acknowledges support from the project DICE (FP7 Marie Curie Career Integration Grant, ID: 631297). 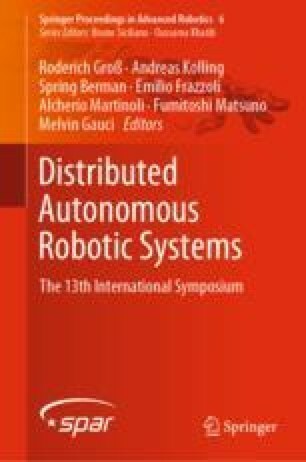 Finally, the authors thank Michael Port for the valuable help in building the infrastructure necessary to conduct the robot experiments.